I like to think that citrus fruits are the universe’s way of apologizing for the misery that is Canadian winters, like a promise that warmer days are just around the corner. Canadian weather being what it is, you’ll probably have to tough it out through a couple of late-March snow flurries, but at least that’s a good excuse to hide indoors and bake cake. And if you’re in need of a cake to bake, may I suggest this one? It’s a perfect way to celebrate my favouritest of the winter citruses, the oh-so-elusive and seductively bittersweet Seville orange. My first experience with bitter oranges was at an early age, on a family trip to Portugal. The trees were full of ripe oranges, filling the warm early summer air with their delicious aroma. My father, ecstatic to see such a bounty literally ripe for the picking, couldn’t resist reaching up and grabbing one from the tree. However, excitement quickly turned to dismay once he took his first bite and realised that those gorgeous oranges had been left untouched was because they were entirely ornamental. They were bitter and sour and full of seeds, but oh my, did they ever smell amazing. I still get excited when I spot bitter Seville oranges at the store, but for entirely different reasons… now I know that with a little patience and a lot of sugar, these lumpy-skinned, seed-filled citrus fruits can be transformed into a delicious homemade marmalade. They’re only in season for a brief moment in late winter and tend to be hard to find, which makes them doubly covetable – which is probably why I went a little overboard on the oranges this year. After chopping up enough to make a half-dozen jars of fresh whiskey marmalade, I still had three oranges left over. So I decided to try something a little different and riffed off a favourite recipe from Bon Appetit to create this lovely orange and cornmeal cake. 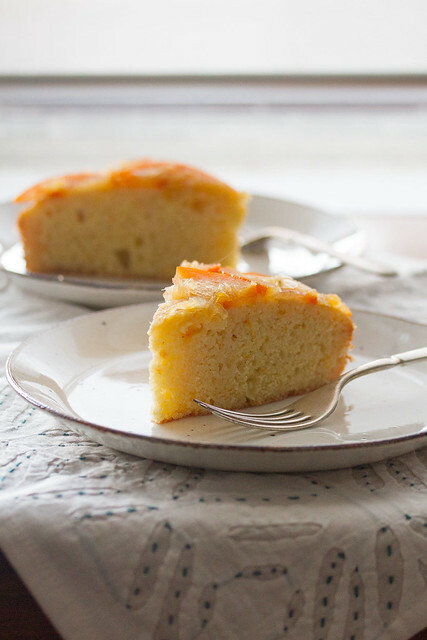 To put it simply, this cake is a citrus lover’s dream. The thin slices of candied Seville orange deliver a hefty dose of marmalade flavour, which is tempered by the nutty cornmeal cake soaked in an orange-scented syrup. 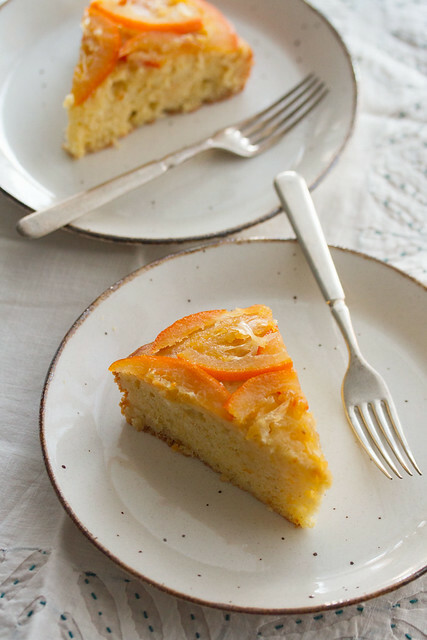 If you love marmalade, you will love this cake. On the other hand, if you’re more of a strawberry jam kind of person, this probably isn’t for you. BTW, while I do love the hint of bitterness the Seville oranges add to this recipe, feel free to substitute with easier-to-find oranges if you want, whether it’s Cara Caras, blood oranges, or even plain ol’ navels. The resulting cake won’t be quite as intensely marmaladey, but it’s just as good for curing those is-spring-here-yet blues. 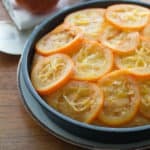 Bring a little sunshine to a winter afternoon with this simple cake featuring candied Seville orange slices on a tender orange-scented cornmeal base. In a medium-sized saucepan, bring the water, sugar, honey and cardamom to a simmer, stirring until sugar dissolves. Add the orange slices, and reduce heat to medium-low. Simmer for about 45 minutes, turning the orange slices occasionally, until the oranges are tender and the syrup is reduced to 3 cups. 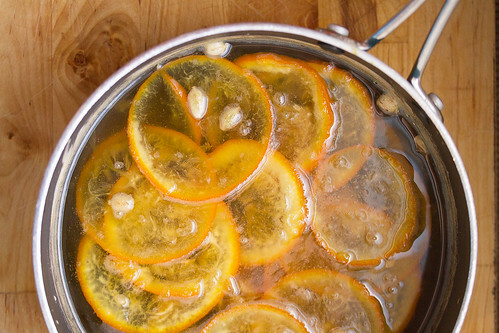 Remove from heat, and stir in the orange blossom water. 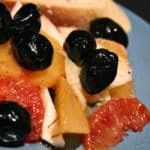 Arrange the orange slices on the prepared baking sheet. Strain the syrup and set aside for later. Preheat oven to 350°. Lightly butter an 8” springform pan with parchment, and line the bottom with parchment paper. In a medium-sized mixing bowl, whisk together the flour, cornmeal, baking powder, salt and baking soda. In a second bowl, beat together the olive oil and 1/4 cup sugar. Beat in the egg yolks, one at a time, then add the yogurt, orange zest and vanilla. Add the dry ingredients and beat until smooth and well combined. Using an electric mixer, beat the egg whites until soft peaks form. Gradually add in the remaining 1/4 cup sugar, beating until firm peaks form. Gently fold the egg whites into the batter, working in two batches. Pour into the prepared pan, and smooth out into an even layer. Bake in preheated oven for 35-40 minutes, or until a toothpick inserted into center comes out clean. Using a toothpick or thin skewer, poke all over the top of the cake. Slowly drizzle the cake with 3/4 cup of the reserved syrup, wait for it to absorb, then drizzle again with another 3/4 cup of syrup. 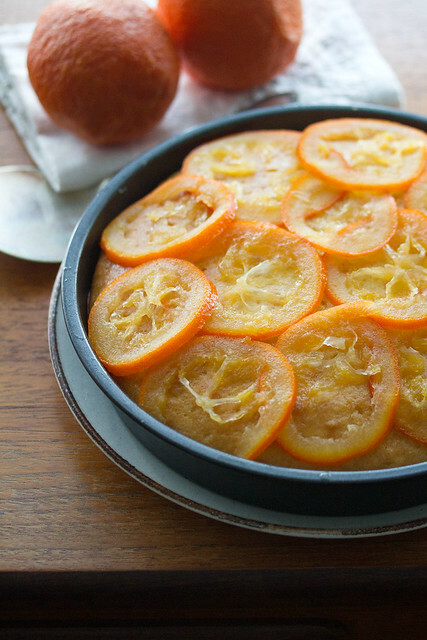 Arrange the candied orange slices all over the top of the cake. Place the pan on a wire rack and let cool completely. When ready to serve, run a thin knife around the edge of the pan to release, then remove the sides of the pan. Cut into wedges and serve drizzled with more syrup. Oh my gosh. I haven’t had polenta cake in so long. Definitely need to try this out. That is one stunningly beautiful cake. Must make polenta cake now. 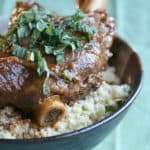 This is gorgeous and sounds like it tastes amazing! Saving!! I’ve never heard of a bitter Seville orange. Your cake looks lovely and I’m sure it has terrific flavor! 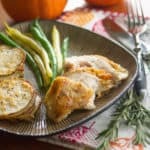 I love how unique this recipe is! And it’s so pretty! 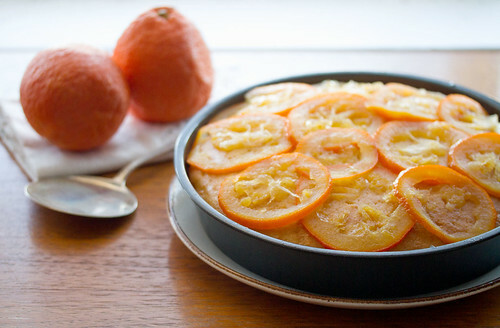 This looks absolutely lovely Isabelle and I love the idea of the cornmeal cake under those oranges. 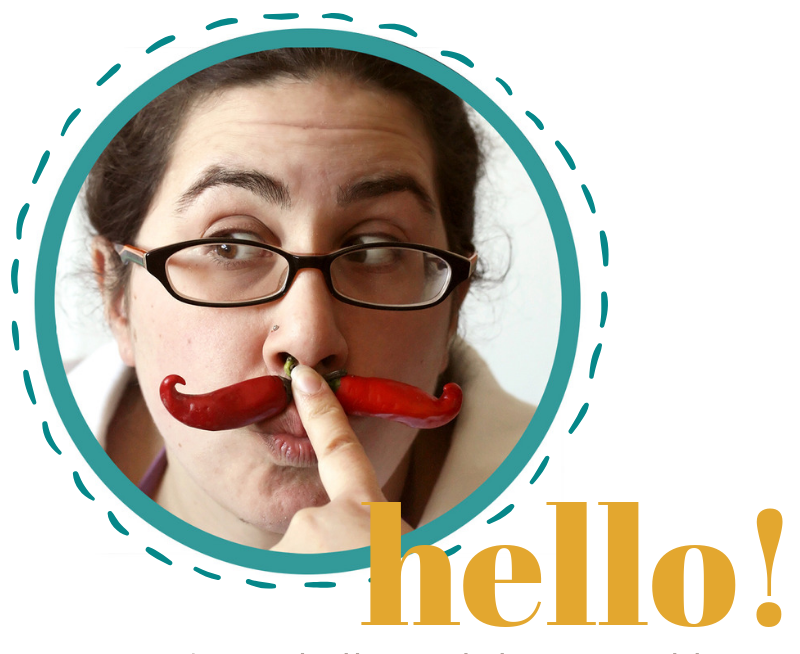 Silly question maybe – you can eat the entire orange? Skin and all? Is it like eating a big bit of marmalade? I’m not sure I’d want to eat an entire Seville orange raw… compared to a regular “eating” orange, they have a much thicker, drier pith and thicker inner membranes, and the flesh is quite sour and full of seeds. The flipside, of course, is that the pith and membranes and seeds are full of lovely pectin, which is what makes these oranges so perfect for marmalade! 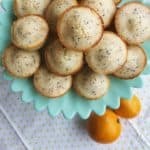 They are perfect for making candied orange slices, though, or for making that beautiful Middle Eastern almond cake which uses a whole orange that’s been boiled until soft and then pureed. 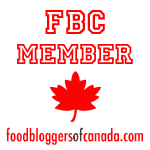 The seville orange marmalade is a staple in my pantry, even though it’s the English version. My husband lived in Portugal for a few years and he often talks about the amazing oranges he used to get there, by the sackful for his breakfast juice. Funnily, he brought a huge box full of them home this week for juicing too. That’s a beautiful cake and it brings back lots of fond memories. I cannot promise I’ll bake one, as I actually love eating seville oranges, so they don’t last long enough! Have you tried eating them with some Himalayan salt on them? I’ve never heard of anyone eating Seville oranges straight up (nor would I have thought to try it myself after seeing my father’s reaction! ), but your tip about eating them with a sprinkle of salt reminds me of a friend in high school who loved to snack on lemon wedges sprinkled with salt. He swore the salt tempered the sourness of the lemon, so I could totally see how it would work just as well with the sourness of these oranges. I’ll have to give it a go the next time I have some oranges!